Anthracite Black Furbo Barrier Door Mats with spiked backing to make it non-slip. modern and contemporary deigns. Cheap and Affordable Door Mats to buy online today at Abbey-Carpets. Greet your guests with a warm welcome with this new Furbo Anthracite Door Mat. With a moulded rubber base it is non-slip and is extremley modern. Affordable door mats to buy online today at Abbey-Carpets. Become the talk of the town with this new Furbo Anthracite Black Barrier Door Mat. With a hi-low carpet surface moulded with a rubber base and borders it is of the best quality on the market. With Tufted Polypropylene loop pile made for indoor and outdoor use and to guarantee your safety a non-slip rubber backing making it your best purchase of the year. Bring your home up to date with the latest interior fashion with this furbo anthracite door mat. Affordable door mats to buy online today at Abbey-Carpets. Bring a new, modern feel to your home with this new Colorit Brown Barrier Mat. Easy to wash and incredible quality. 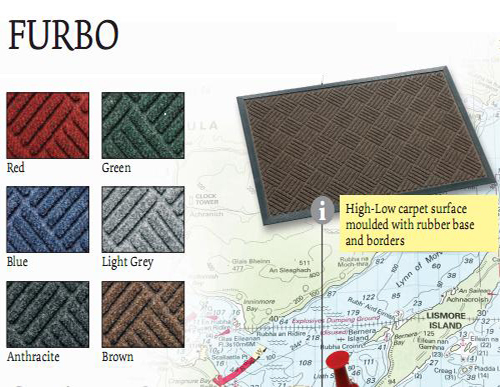 Affordable door mats to buy online today at Abbey-Carpets. Lighten your home with this new Colorit Lime Green Barrier Door Mat. Greet your guests with a colouful welcome with this modern colour and simple design. Cheap and Affordable door mats to buy online today at Abbey-Carpets. Bring colour and vibrance to your home with this new Colorit Orange Barrier Door Mat. Guaranteed to liven up your home and bring a colourful modern theme. Cheap and affordable door mats to buy online today at Abbey-Carpets. Introducing the new Furbo Brown barrier door mat from our new Furbo range. With a rubber non-slip backing it is of the best quality and value for money pn the market. Affordable doo rmats to buy online today at Abbey-Carpets.